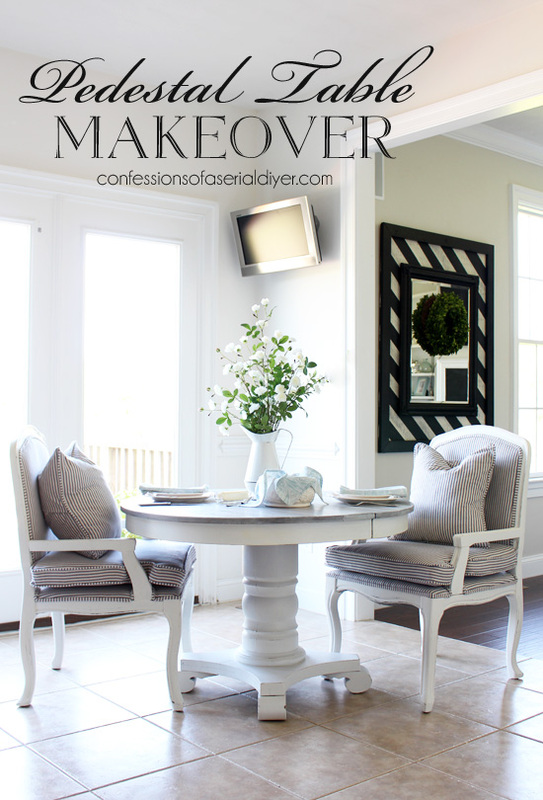 I am SO excited to have a brand spankin new makeover to share with you today, fabulous Friends!! I Iove how this one turned out! Working in my new organized garage (See that beauty HERE if you missed it.) made it so much easier to tackle this project! In my garage reveal I shared a little peek at today’s project piece: a table I picked up just before the big move. I knew that for my eat-in kitchen area, I wanted a round table. I originally decided I would treat myself and go wild and buy a brand new set for that space. I knew it could make a great kitchen table. I had been so busy working on house stuff that I almost forgot that my day with my Furniture Fixer Upper girls was coming up. Luckily I had the perfect furniture piece! 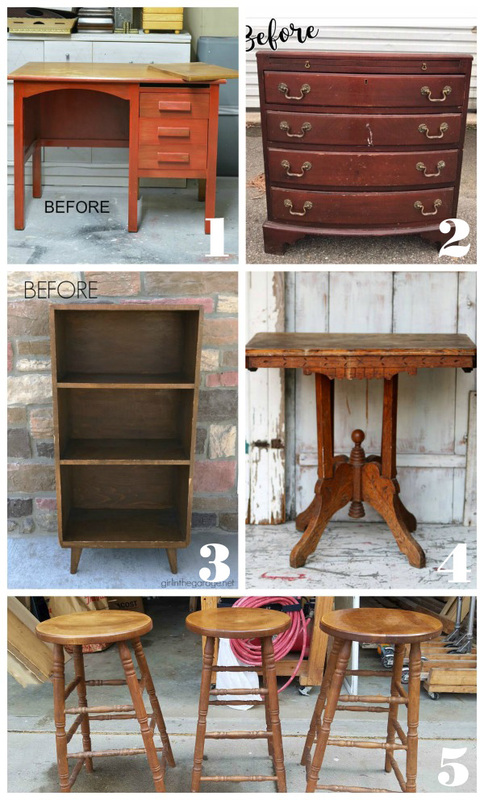 My friends are sharing furniture makeovers of their own today, so be sure to look for them at the bottom! Isn’t she perty?? 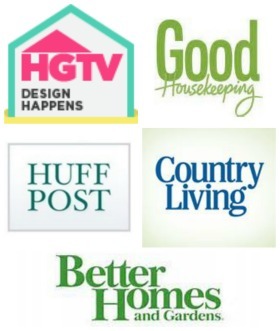 I’m including a few affiliate links so you can find the products I used. It doesn’t even look like the same table! I made the seat covers with zippers so they could easily be removed for washing. Now I’m on the hunt for two dining chairs with similar lines that just have upholstered seats that I can add the ticking to as well to create a coordinated set. 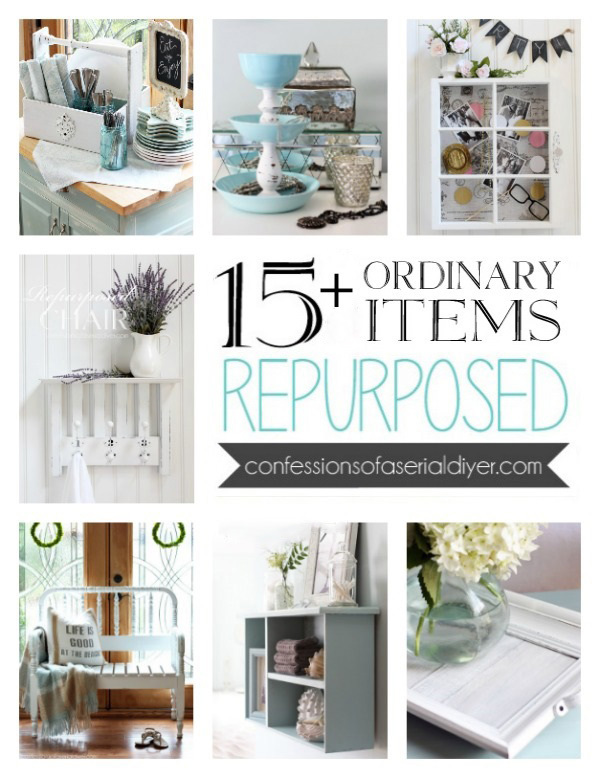 I recently redid a sofa table very similarly (see it HERE) and I just love this look! Then I used my shop-vac to remove the dust and wiped it down with a clean soft cloth. 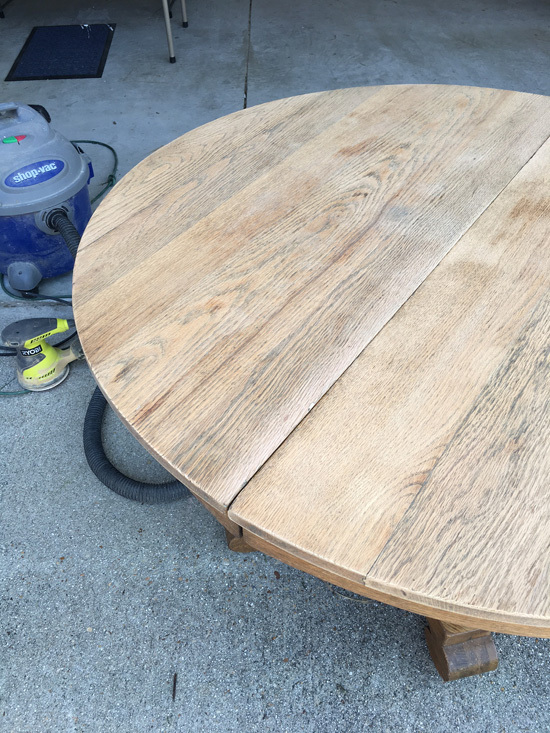 I added a coat of Minwax Wood Conditioner on the top surface, applying it with a clean soft cloth. This helps the stain to absorb evenly. Unfortunately my container of leftover Driftwood Weathering Wood Finish that I mixed for my sofa table not too long ago spilled in the move, and I didn’t have anymore so I decided to try Varathane Weathered Wood Accelerator. It worked very similarly except it left the top feeling a bit rough like it needed another sanding, so I lightly hand-sanded again with 220 grit sandpaper when it was dry and it was good to go. After the entire top was complete I went back and played with it a little, removing more paint in areas using a dampened cloth, and then adding more paint in areas where it needed more depth. I sealed the top with General Finishes High Performance topcoat in a flat finish. I usually use polycrylic by Minwax but I wanted a more flat finish so I gave this a try. It worked really great. 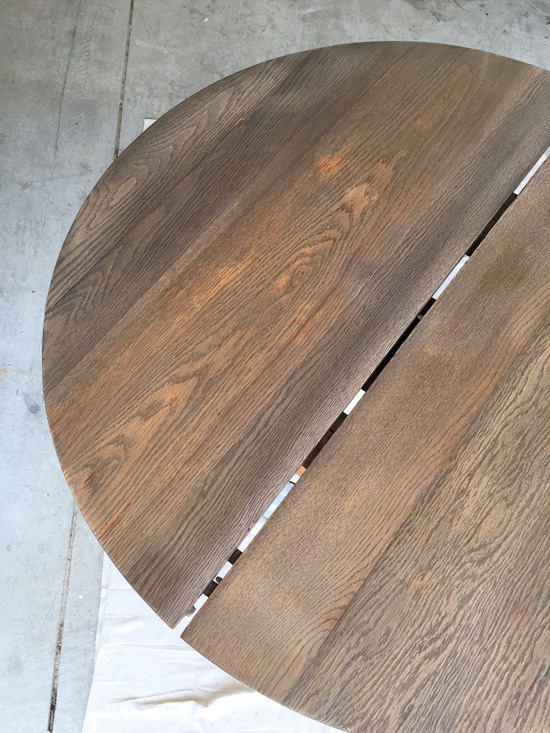 Three coats with a light sanding in between each coat did the trick . I applied it with my favorite brush found HERE for applying poly/topcoats. 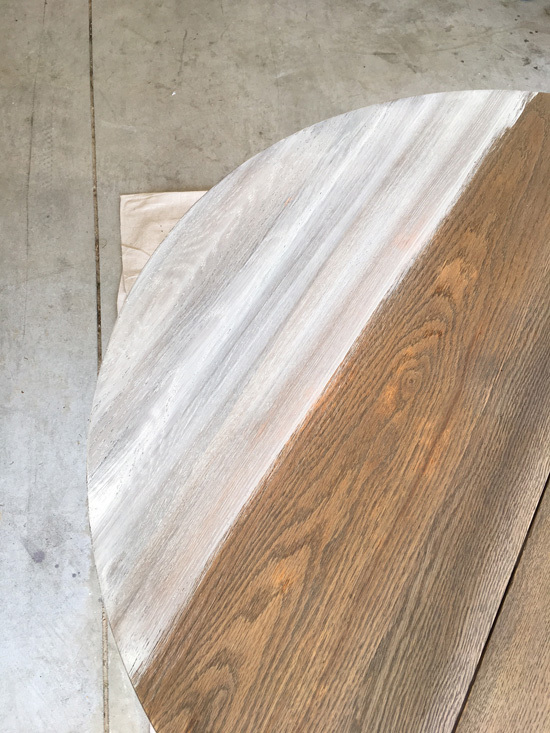 For the base of the table, I used Fusion Mineral Paint in Casement. 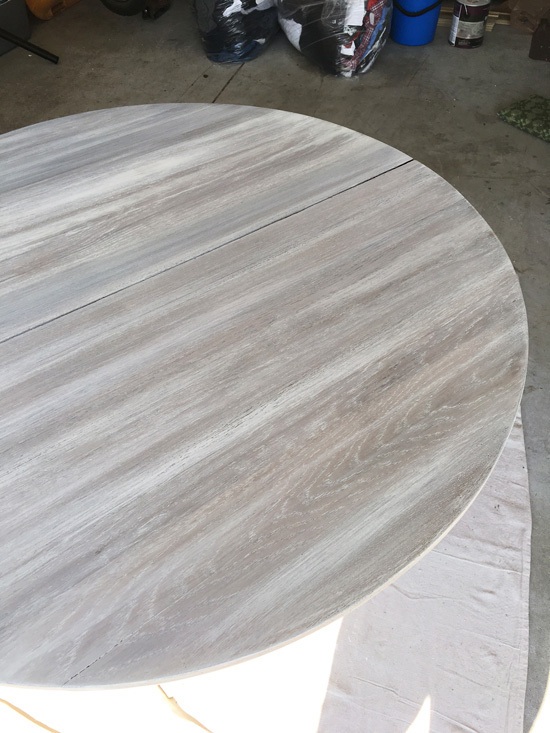 I had originally ordered it to update my dining table and chairs and hutch since it requires no topcoat, and figured I’d just use it on the base of this table since I didn’t have any of my DIY chalk paint already mixed in white. Some said it will not yellow over white paint, and others said it would. I added a coat over the sides of the table top to try it out and it did yellow slightly. You can actually tell a bit if you look at the photos again. I will need to add another coat of the Fusion on top of that. This was my first attempt at photographing furniture in the new house, and it wasn’t too bad. These tall windows in my kitchen let in a ton of natural light which really helps! As you can see the bookcases still aren’t styled and we have yet to hide the cord from the TV to the cable box, but it is progress! 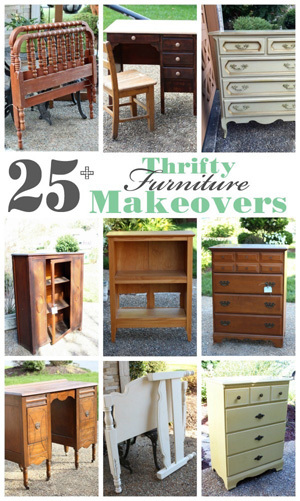 Now for my Furniture Fixer Upper friends’ makeovers! Visit the afters of these treasures at the links below the image! 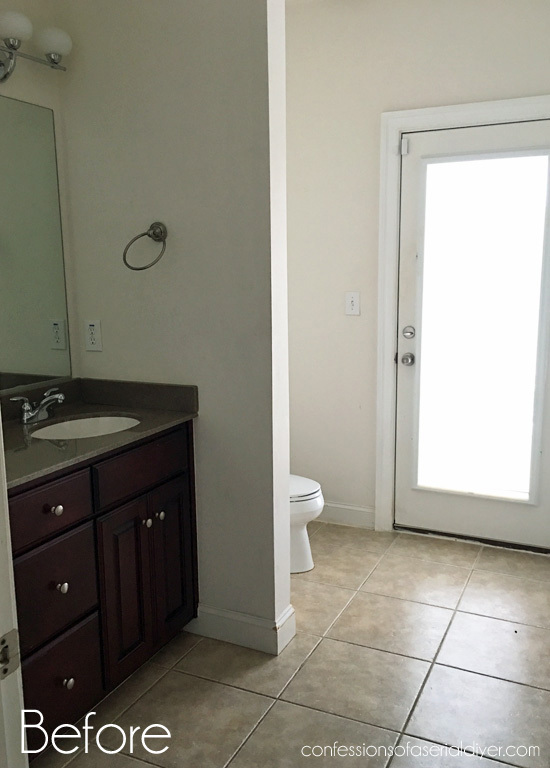 UPDATE: Check out how I updated this bathroom HERE now! Christy I have to say I love that soft whitewashed look the best. It is elegant and coastal at the same time. Your new home is coming along nicely. Another masterpiece! 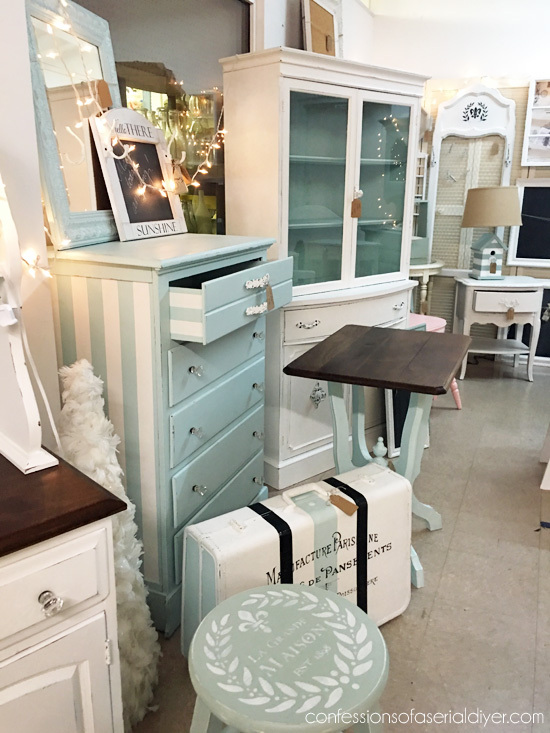 Hugs from Central VA.
Christy, you are rockin’ your new home and that table is da bomb! I love the new look – so refreshing. PInning! 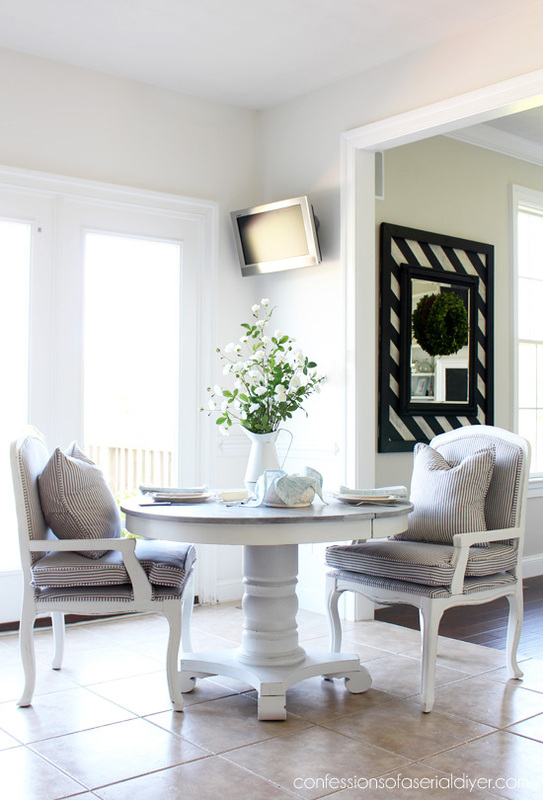 Love the pedestal table. Was glad to see a new makeover but know you’ve been busy and always welcome to see what you’ve done to your new house. It’s looking very pretty so far. Well good morning Wonder Woman! 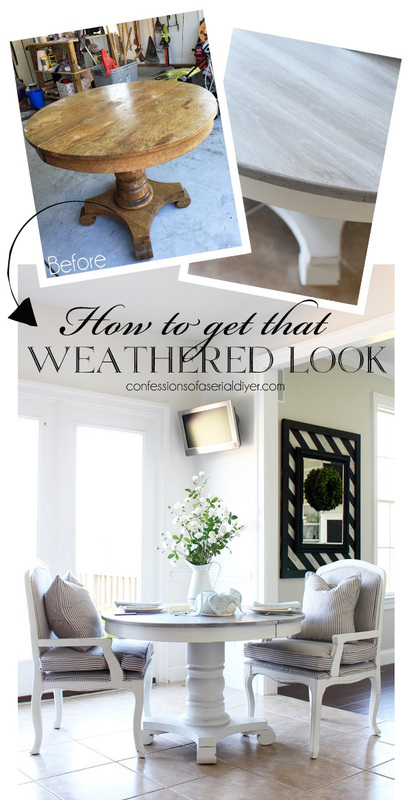 You blew me away with this table and, of course, I love the chairs you re-upholstered. 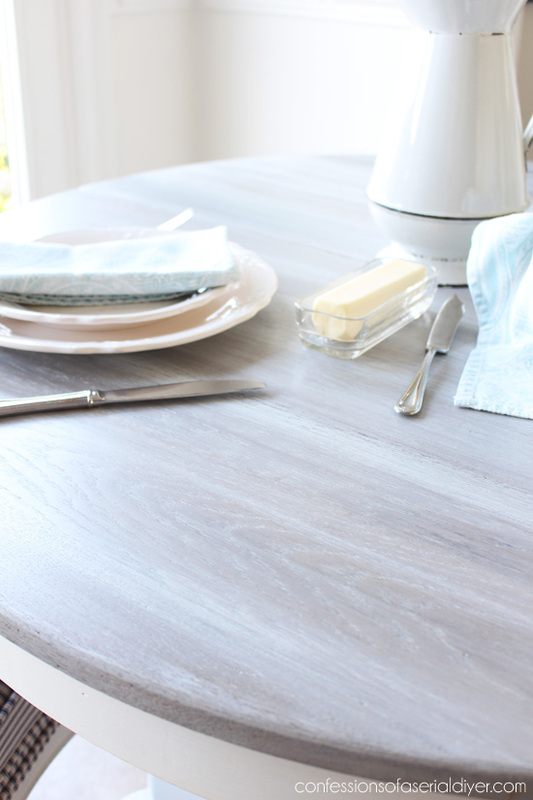 I love natural wood so the beautiful finish on the table top is stellar. 🙂 I’m glad you found it and are keeping it. I kept wishing for a photo from the window side of the table so I was tickled with the top down shot to see the beautiful finish. Thank you!!! 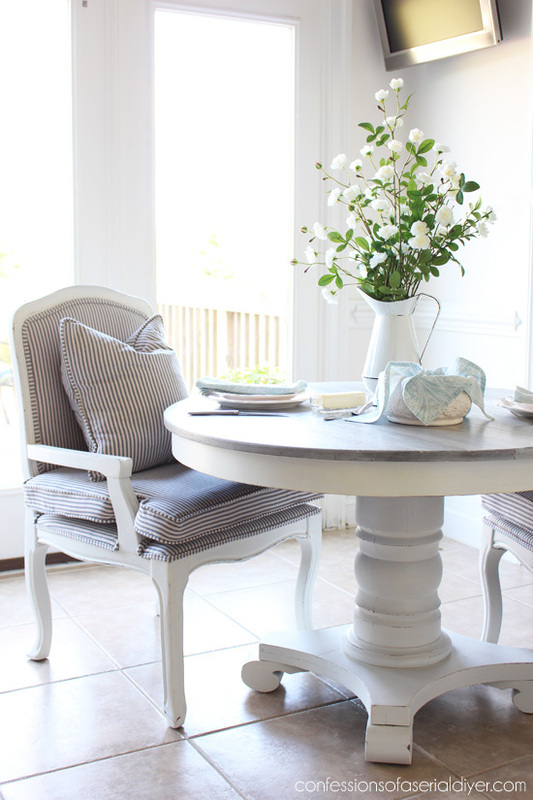 This table is perfect for your coastal home! I love the finish you gave it and the top looks great with the painted base. Beautiful, Christy! It’s hard to look at new furniture and feel the same passion, isn’t it? There’s something about older furniture that just calls to your heart (not to mention your wallet 😉). As I was reading, I was thinking that I didn’t miss the old leaded glass doors. This is a great corner for photos! BTW, life is too short to worry about bookcases! 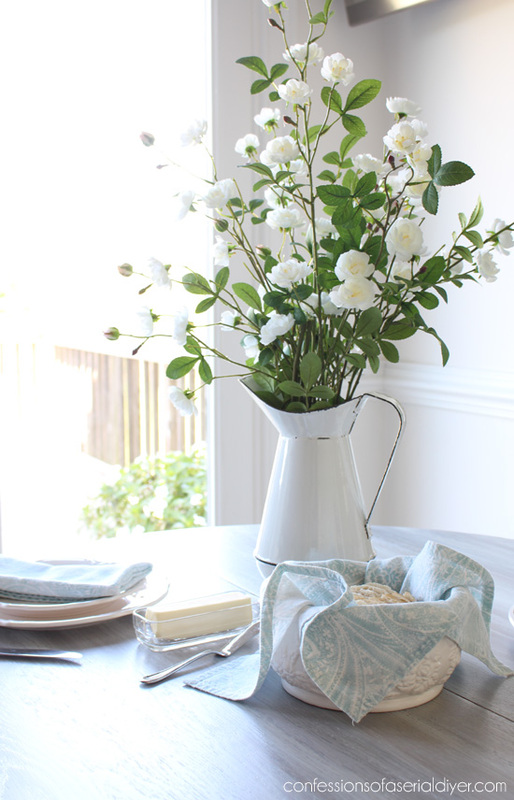 Enjoy fixing up the house at your pace, given everything else you have to do. The house will come together in its own time, although I get that it’s hard to be patient when there’s so much to be done. 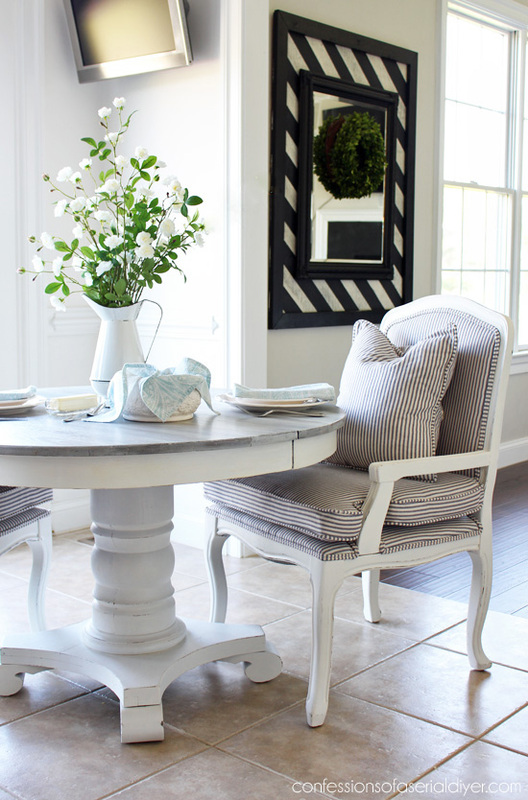 I rarely *LOVE* a table makeover but you totally nailed it with the driftwood looking top. It looks like more work than I want to put in but the end result is stunning. Love the smooth almost matte finish with a tiny sheen. It’s beautiful! So lovely! One of my favorites of your transformations, to-date. It’s STUNNING!!!! and I’m in love! Beautiful job! Fabulous! Love it! Pinned it! Thanks, Nancy! You can see the yellowing in person more easily. I think that topcoat will be great on anything but bright white though! And yes…I was worried about finding a good spot for pictures, and luckily there is a lot of natural light in this house. I had exactly two spots in my old house that always required shuffling of heavy furniture to use ha ha! Very nice. How well does the white hold up to every day use on the base and chairs? Do you find a certain paint holds up better? I do have a question for you though, where can I find a mirror like the one in your living room? I need a large mirror for over my mantel and that one might be a winner! Love the “new” table! 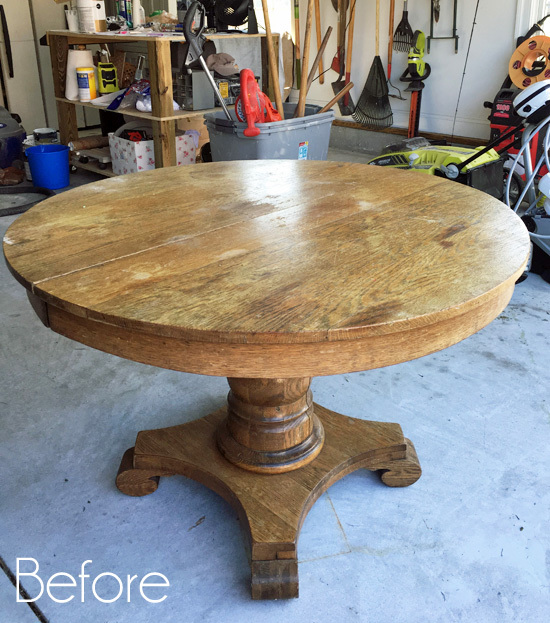 I used a gray chalk paint “wash” over stain when I refinished my dining table. 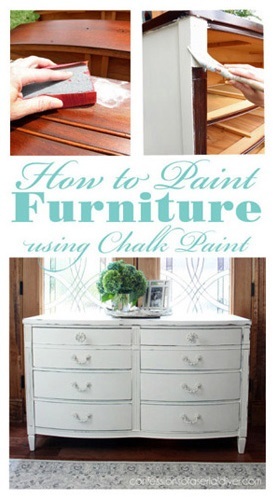 The gray tint gives the top an aged look that goes well with my chalk painted armoire. Christy, I am so glad you went with your instincts and did not get some matchy-matchy store bought nonsense. This is beautiful. I really love how this table turned out – it has given me just the inspiration and push I need to makeover my own kitchen table! Thanks for posting the instructions. Your table looks gorgeous, Christy! Especially paired with your pretty armchairs. 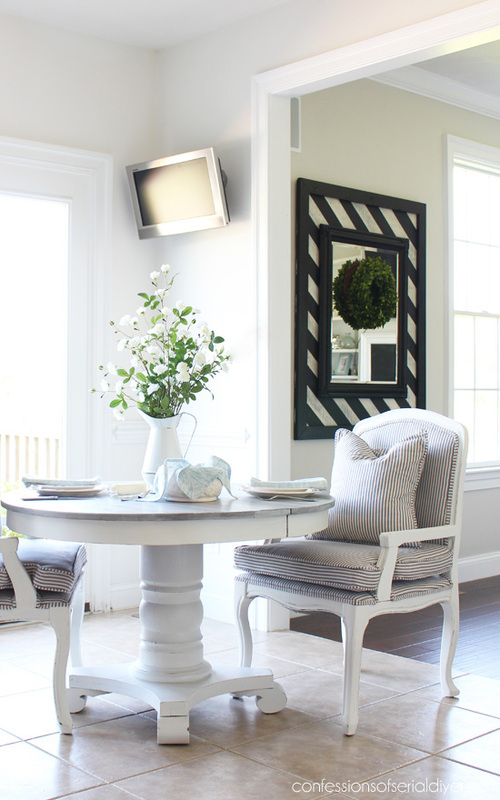 Love the driftwood top and it really picks up the ticking stripes on the chairs. Looks like things are coming together nicely in the new house. I’m with you on having the tv over the fireplace (as much as we hate them being a focal point), the furniture placement seems much better this way. Oh Christy I LOVE the round oak table!!! I have one very similar to yours that I am dying to paint. You have given me the inspiration I needed!!! Love your new home! Cannot wait to see each room!!! hope this comment and question reaches you and generates a response. This project is a breakfast table and obviously meant to take “abuse”. Please tell me how you will maintain the table top. Wipe with a damp cloth???? Hi Patti! I sealed the table top with three coats of the matte sealer I referenced in the post and it is super durable now. And although it is supposed to be matte, it has a very subtle sheen which makes it easy to wipe clean. So far I have used Lysol wipes and also a dishrag and spray cleaner on it to clean it and it has done great! Oooo! Love the table and the finish you did on the top! The chairs are perfect with it! I like the arrangement of your living room – looks so cozy! It turned out so great! I love the weathered wood top. Awesome!!! Thx for sharing your talents. 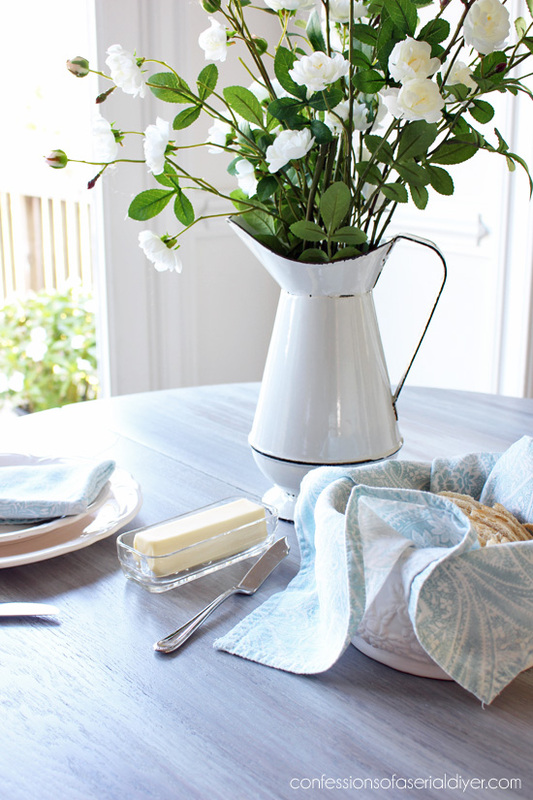 The table is gorgeous and the chairs look so professional with the ticking stripe fabric. You did a great job on the whole set! Very beautiful. Appreciate the tutorial! You did it again! The table looks great! And the cushions with the ticking stripe are perfect with it! Hope things are going well in the new abode!